I'm not happy about the fact that updates have stopped either, believe me. I do plan to continue with this comic in the future but for the time being my priorities lie elsewhere. As much as I love comics I'd rather have food to eat and a roof over my head so comics are taking a back seat until real life settles down. 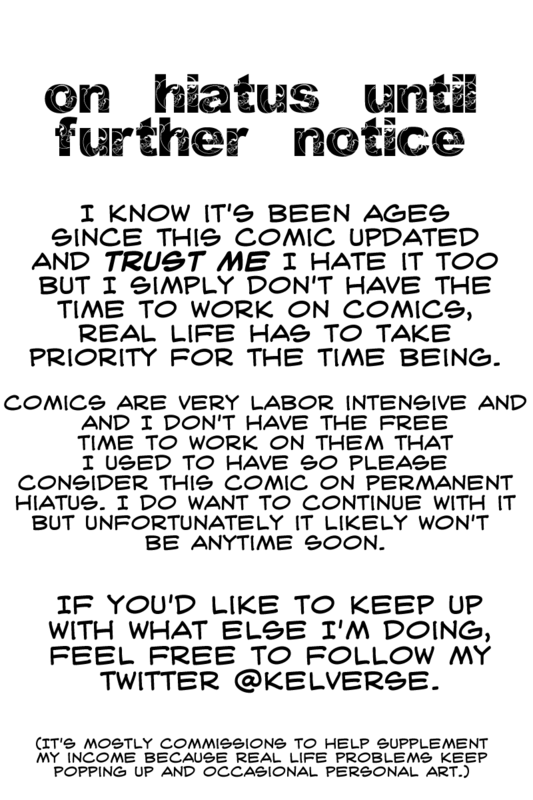 It's not that I don't want to share this story, I do that's why I posted it online in the first place, but I no longer have the free time to dedicate to drawing comic pages every week. They take a lot of time and work and right now that energy is better used for commissions since adulthood is taking all my money. I know this isn't what anyone wants to hear and it's absolutely not something I enjoy admitting but that's just how it is. I sincerely thank everyone that's been supporting me and my comics all this time and been so patient with me through the past year and a half as it's been really rough on me both in terms of art and real life issues and I hope I'll see you in the future when I'm able to resume production/updates. IF you'd like to keep up with what I'm doing in the meantime, feel free to follow me on Twitter @kelverse as that's where I'm most active these days. I'm bummed to see this, but I understand completely. So oh well, this'll only make your triumphant return all the more magnificent. I wish you the best of luck, Rinkelle. Thank you so much~ I really appreciate the support! I just hope I can make a swift comeback lol I really do miss updating. I'm sorry to hear this, but I'm glad you're still doing commissions, so that you still have some creative outlet as well as helping make ends meet. And if you ever do bring back Xenobiosis, I'll be there with bells on to see it. Lol I could never stop doing art entirely (I had to give it up for a month after injuring my drawing hand and it was torture) so I still make art, I just don't have the time to put into a weekly-updating comic, it's a lot of work and a lot of time I don't have anymore. I will be coming back to this comic in the future, without a doubt, I just can't give an idea as to when yet. Thank you for the support, I'll see you in the future! Damned real life, always gets in the way. I'll be here wishing you all the best.